Now that Bernie has declared that there will definitely be night races in F1, it seems the FIA are getting down to the task of assessing the viability of such races. Autosport reports that a test has been conducted at the Indianapolis circuit to decide whether drivers can see well enough at speed under floodlit conditions. Apparently, the FIA safety car and some medical cars tackled a few corners "backwards and forwards" for half an hour. Apart from the mystery implicit in that backwards/forwards statement (What, they reversed? Or did they lap the circuit in both directions? ), I find that the names Heath Robinson and Rube Goldberg keep occurring to me. It seems a bit late to start testing after a firm commitment to night races has been made. And how relevant is a test conducted by saloon cars (presumably with their lights turned off) in a stadium supplied with floodlights? I suppose that the idea is to start slowly and build up to actual F1 racing speeds but when one considers that the first night GP will be held on a street circuit, perhaps in the rain, it seems pointless to prove that drivers of road cars in very different circumstances don't have a problem with vision at night. At least they could have thrown some water on the track to see how confusing reflections can be. Perhaps the whole thing is a public relations exercise and we are intended to draw the conclusion that, if the safety car can zip through a few corners under floodlights at Indy, the likes of Alonso and Raikkonen should easily master Melbourne streets on a rainy night. Somehow, for me, that doesn't wash. There used to be a convention that, before allowing a GP to be held on a new track, one of the lesser formulae would stage a race there; it made sense that any problems would be uncovered by slightly slower cars before the technical masterpieces of F1 were unleashed upon the circuit. But in the brave new world of 21st Century F1, Bernie's whim is law and what he says will happen, will be so. 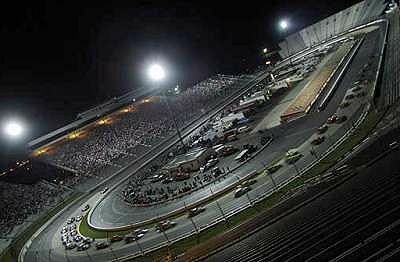 Give the drivers their due: most of them are not averse to the idea of night races, provided that safety is not compromised. That is an important proviso, however, especially if the FIA is going to present its Indy test as proof that the idea is workable. I would think that the drivers would require a good deal more assurance than that before being satisfied that night GPs are safe. The problem for the FIA is that the proposed night races are to be held on street circuits. They cannot be tested beforehand without the city agreeing to shut down for tests to be held. And that means more expense, more problems for the organizers, more disruption for the city. The whole idea begins to look like more trouble than it is worth. Let us remember that the only reason Bernie came up with the idea was to be able to televise the races at a time more convenient for European audiences. Aside from the fact that the true F1 enthusiast does not mind getting up in the early hours to feed his habit (and it adds a certain spice to the experience, let's be frank), does not this bring into question the FIA's determination to spread GPs across the globe, robbing Europe of time-honored races at the same time? To me, it looks like an admission that the vast majority of F1's audience still resides in its core arena, Europe. Another band-aid in an attempt to make the racing more interesting when the true problem is that lack of racing.... When is this guy going to retire, every year he seems to further alienate his sport. F1 needs a Democracy not a Dictatorship. I would imagine that even those deeply rooted in his pockets must realize what he is doing to there sport. You would think that there would be an attempt to remove him from power. He is damaging the sport and hurting the fans! I think what the FIA were trying to do here was test out a particular lighting system they had in mind for night races. Remember that it is easier for such a system to be fitted at Indy than at many of the European venues because it is so compact and, unlike the similarly-compact Monaco, not a system of public roads. The insistence on using all-FIA, non-single-seater vehicles underlines this for me. There is no way the FIA will verify that night racing is safe (remember Max Mosely has previously said that further testing is needed before a night race may join the calender) until single-seater racing drivers have tested this at night under a pre-approved lighting system. According to grandprix.com, some of the photographs taken from the test were unusable due to being too dark. That tells me that this test was a failure at some level, even if the FIA spins it. At the very least, a more luminous system of night race illumination will be necessary. Well, I suppose it is good that they are trying out systems of lighting at least. The level of lighting should be at least equal to that provided for football games at night, I would think, although I shudder to think how much it would cost to light a complete circuit to such a standard. Maybe Max was just letting Bernie get on with it, knowing full well that the idea was completely impractical. If systems cannot be tested at Monaco, how are they to be tested at places like Melbourne and Singapore? Of course, I agree with you completely that the FIA should be doing something to improve the racing, rather than the show. But do they understand the difference?